Were RotJ Helmets and Armor used in ESB? used in The Empire Strikes Back? 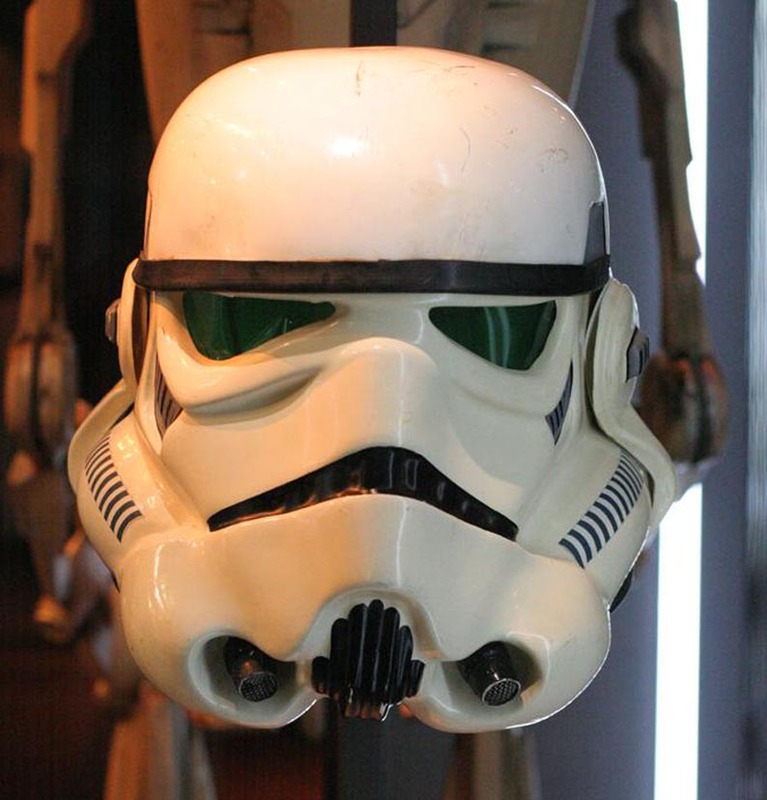 So we can be sure that the helmet we identified a few years ago in London, was the same one used in the movie. When we reviewed it, it was clearly a re-used ANH made from khaki HDPE. 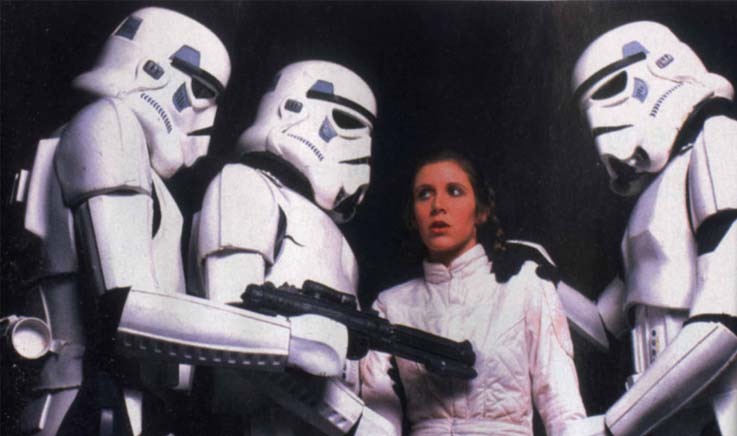 In addition there have been a few shots of Stormtroopers from ESB that have clearly been re-used ANH's, like these three. ...and also these two seen captured by Lando's Bespin Guards.... Again definitely re-used ANH helmets. Okay, so we can be 100% sure that most of the helmets and armor used in ESB were the same ones used in ANH. However, armor-maker Paul "Trooper Master" believed that some helmets and armor seen in ESB were not ANH - and therefore must have been specifically made for the movie. These helmets and armor had more of an RotJ-like appearance. 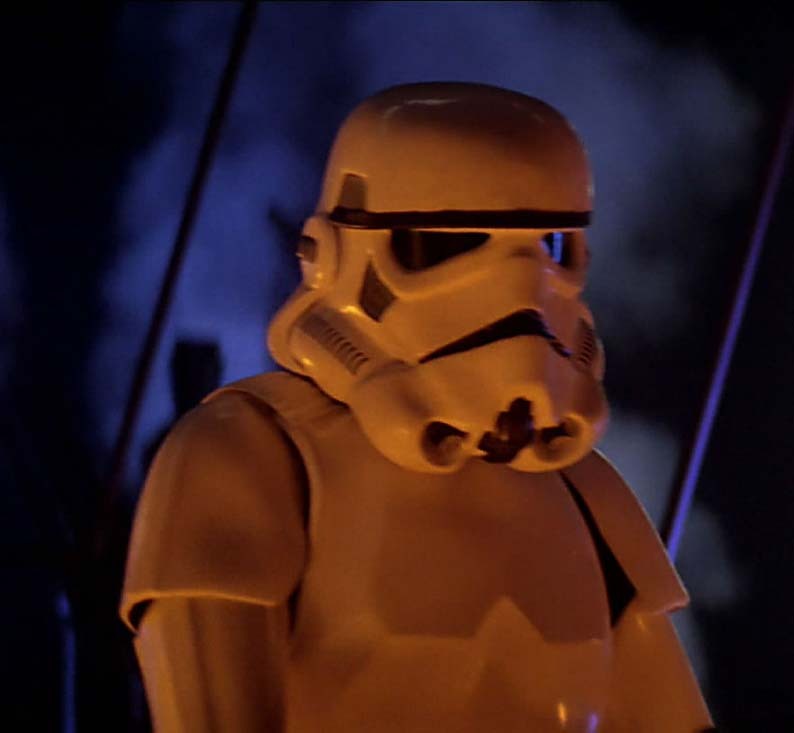 He specifically drew attention to this particular Stormtrooper, seen within the Carbon Freezing/Elstree scenes in ESB are really ANH. Well we know that new armor was produced (and later sold at Christies here) - but what about the helmet? Though this alone is far from conclusive, there's also the following publicity photo taken for Topps Cards sometime on or before 1980. 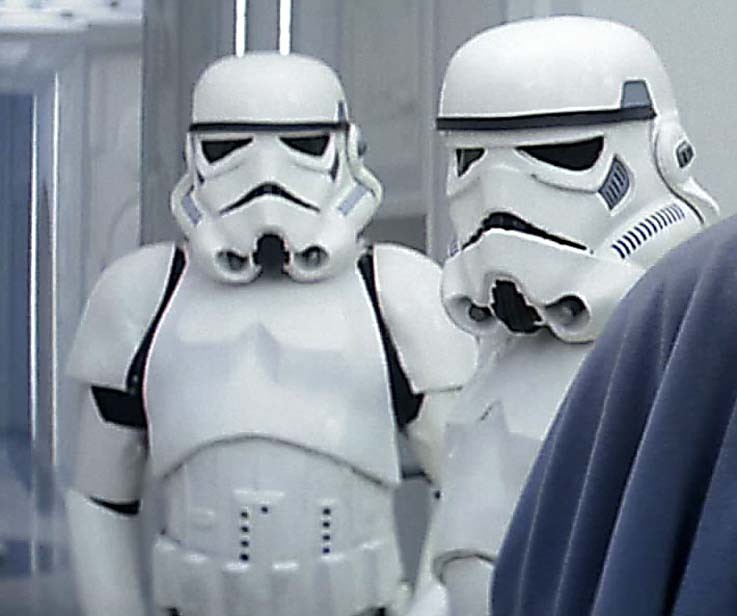 The Stormtrooper on the right certainly has the RotJ look - although again its not conclusive since it could be one of the ANH Hero's taken from an unusual angle (albeit with grey frown). However, still no "magic bullet". 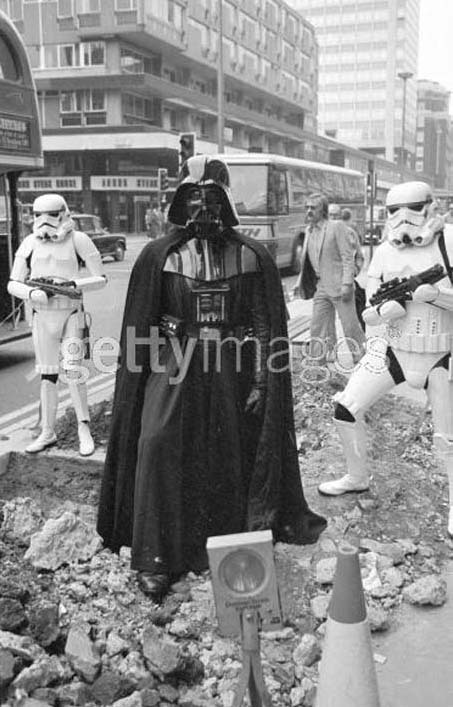 Things get a bit more interesting when you look at the following two publicity photographs, especially as the Getty image on the left is dated 1980 and the troopers in the shot could be RotJ. There's no date for the photo on the right of Vader and two clearly RotJ troopers (although we were concerned that it could be part of the 1983 Harrods RotJ exhibition) - but the detailing on the troopers is uncannily like the ones in the left photo with the right most trooper in both photos having a raised shoulder bell. So here is a comparison of a number of different Stormtrooper helmets all believed to have been used in Return of the Jedi. As you can see they do vary in appearance quite considerably - although we do need to be wary of angle, distance from camera, lens etc. which can all affect the image. 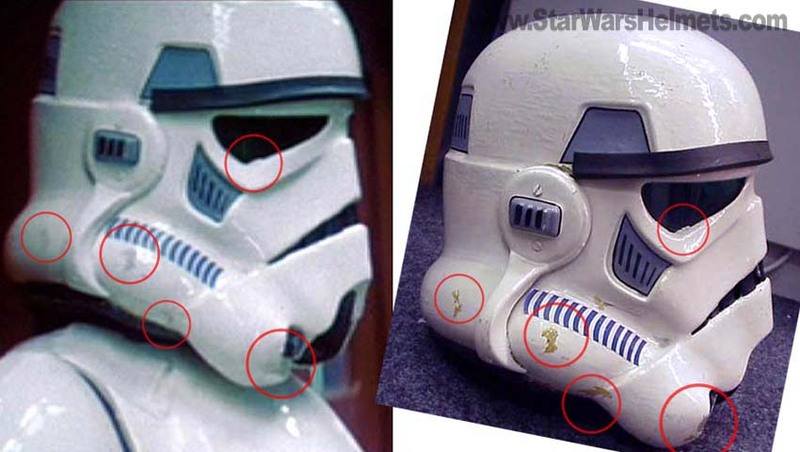 This has led to questions as to whether there were two different moulds, and even whether one of those moulds could have been made for The Empire Strikes Back - resulting in some "RotJ-style" helmets and armor appearing in the earlier movie. 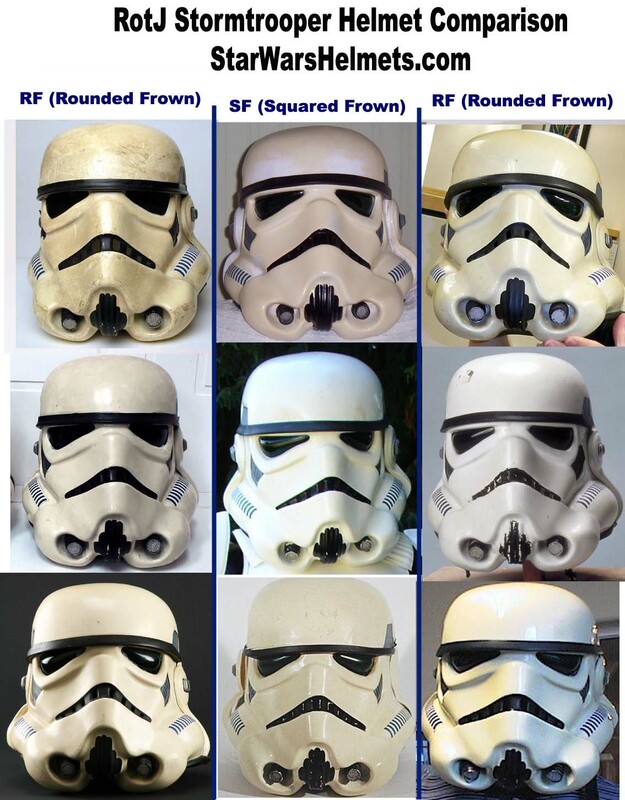 In the composition above of nine original RotJ Stormtrooper helmets, the three in the centre column are the ones we refer to as "Square Frown" (SF)- and the columns to the left and right are all the more common-place "Rounded Frown" (RF). Though both "types" of helmets appear to have been manufactured in a very similar way, the RF's are made out of standard ABS, whereas the SF's appear to be made out of Haircell ABS - which is texture on the inner surface. In addition they have been detailed quite differently. The more common-place RF helmets in the left and right columns) have frowns which are painted a little thicker, with curved or rounded ends, as their name suggests. They also have Aluminium Mic Tips, new "RotJ" style decals and hard-hat liners installed to make them easier to wear - and also two black lines on their ears. 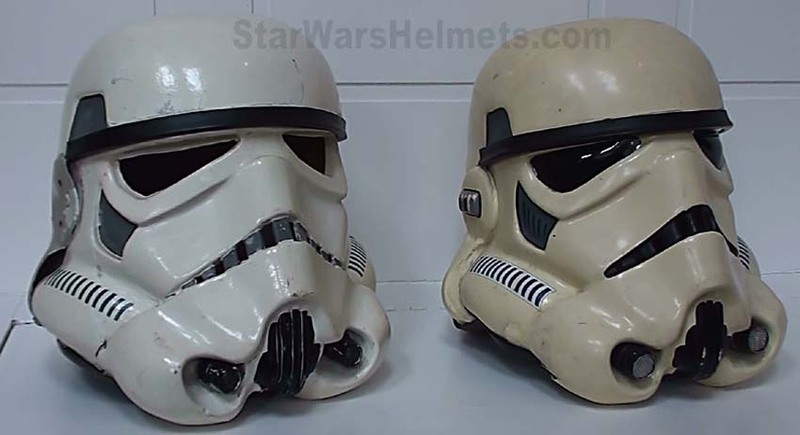 This differs from the SF helmets (in the centre column above) as they don't have rounded ends to their frowns which look to have been masked off in a straight line - much like the ESB Stormtrooper helmets. In addition they don't have Aluminium mic-tips like the other Jedi helmets but has resin "Hovi Mix" style mic tips (like the ESB Stormtroopers). They also don't have the pre-installed hard-hat liners that the the RF helmets have, but instead have foam (YET again like the ESB Stormtrooper Helmets). Also, instead of two, they have three black lines on their ears. Reaching an impasse - Enter Mr Mollo! Well at this stage we needed assistance from someone involved in the production of the Empire Strikes Back. So who better to ask than John Mollo - the Costumer Director for the movie. Mr Mollo has assisted Star Wars Helmets.com in the past and as ever we're extremely grateful of his help. So a couple of phone calls later and Mr Mollo had kindly agreed to meet us to discuss the costume design for ESB and specifically the Stormtrooper. Over the years, John Mollo has proved to be a very reliable source of information for the movies he worked on since he kept chronological �sketch book�s� / diaries which detailed all the work he did including names, dates, art work, �to-do�s� and design workings for his costume work. Leafing through these books is fascinating since they details much of what was going on during the production at that time. 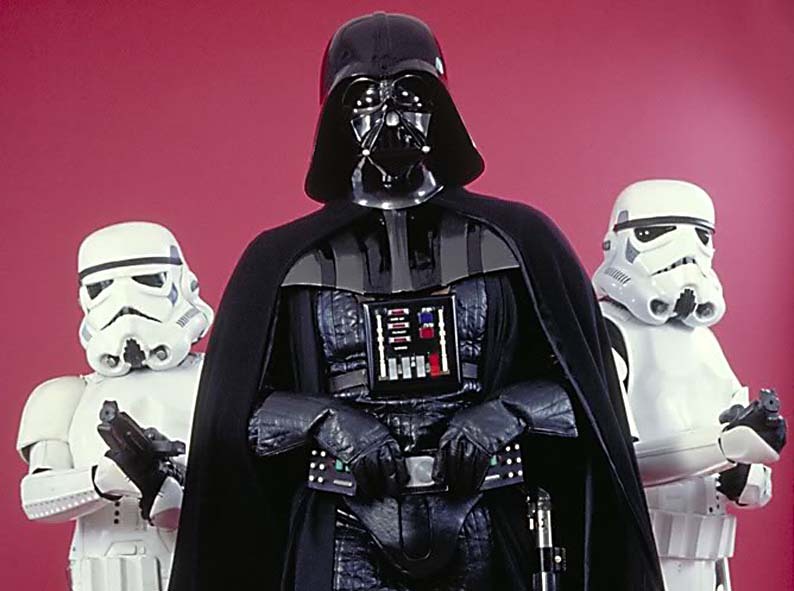 So we spent a considerable amount of time looking at whether any new Stormtroopers were made for The Empire Strikes Back - and thus try and tie up any potential link with RotJ style helmets. 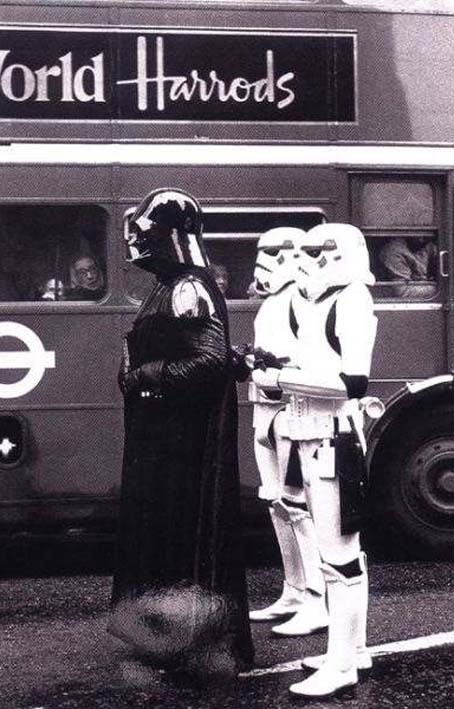 Although we couldn't find a definitive answer, it is clear that SOMETHING new was made for the Stormtroopers in order to produce what was referred to as the "Mark 2 " version - even though from a dates perspective it was done part-way through filming at Elstree in June 1979. Looking at the call sheets, for the majority of the early scenes set on Cloud City/Bespin (filmed before June 1979), there was only a requirement for seven Stormtroopers. It appears that they had just about enough helmets and costume parts to rustle up these seven required sets - but not enough to cover the TEN sets required for the main Han Carbon Freezing scenes and the Leia/Lando Bespin corridor escape. 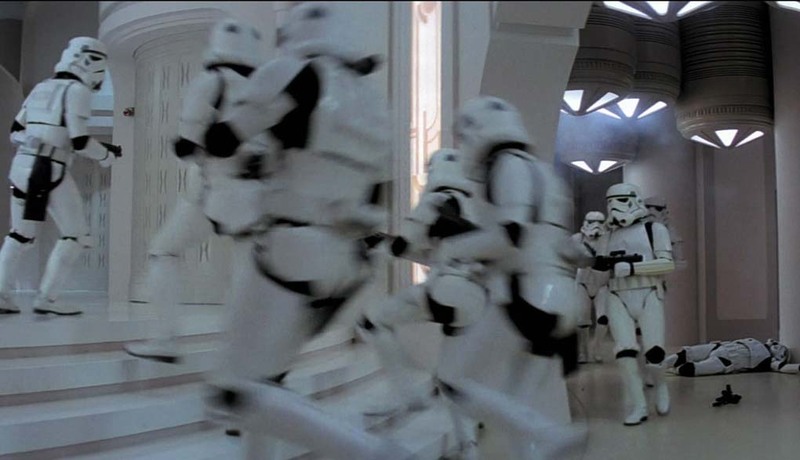 However, the scenes requiring ten Stormtroopers were not due to be filmed until late June/early July hence there was just enough time to vac form new parts - or even complete sets. 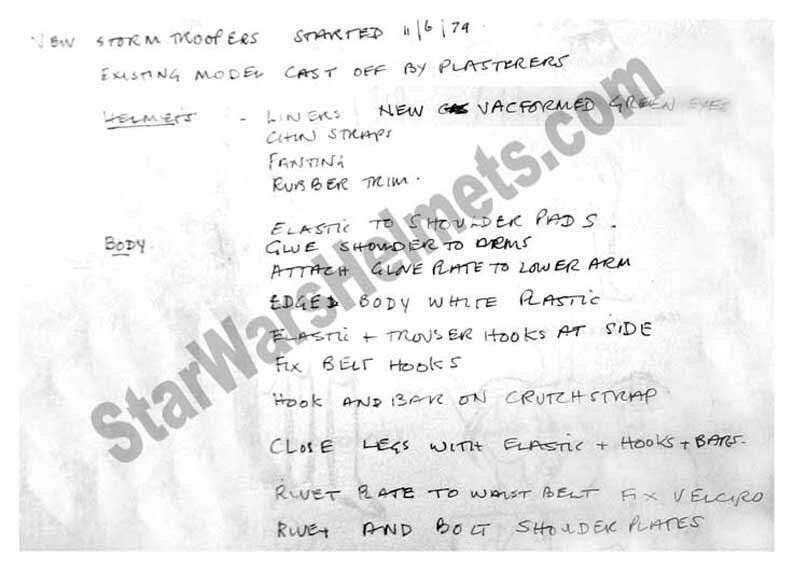 So the new Mark 2 Stormtroopers were worked on, according to Mollo's notes: "Cast off an existing model by plasterers". There's another note in his diary on 19th June saying that the "prototype" was ready - i.e. well in time for the Carbon Freezing scenes over the following weeks. Helmet - "New liners, chin straps, trim, decals and new vac-formed green eyes" . 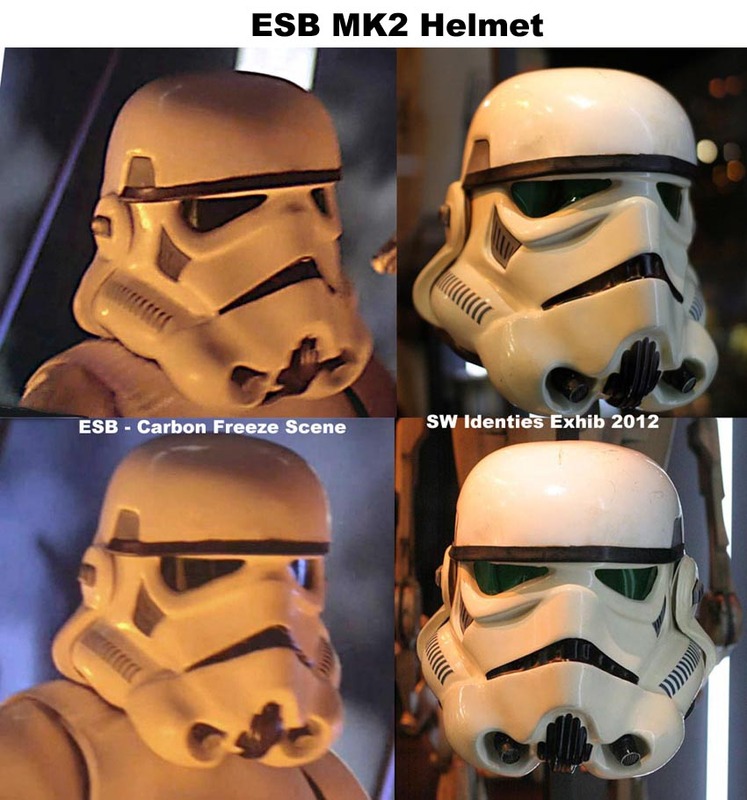 However, all but the vac-formed eyes appear on ALL the ESB Stormtrooper helmets so we cant say they are unique to any Mark 2's. 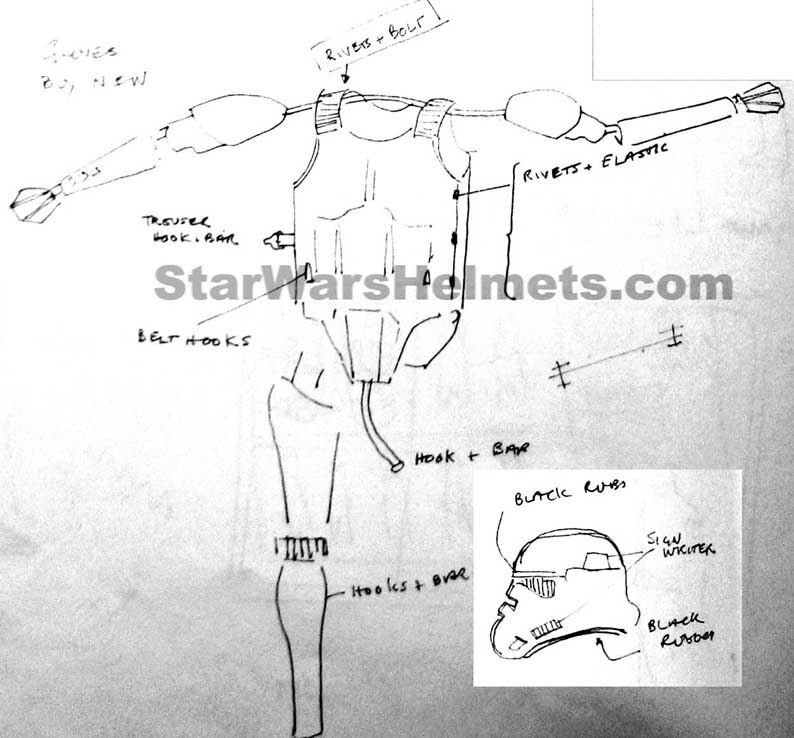 Most of the changes were to assist the wearers, such as �Elastic for the shoulder pads�, �glue shoulders to arms�, �rivet and bolt shoulder plates� - although interestingly also includes �Edged (armor) body with white plastic� � something more commonplace on RotJ armor. However, as with the helmet, these could all be changes on every set of ESB armor - not just the Mark 2's. So what we need to try and understand is whether ENTIRELY NEW Helmets or Armor were produced, or just new parts to augment some of the existing sets that were simply not good enough to used on-screen. So we know that the Plasterers (who make the moulds) were budgeted 7 hours work, with the Vac-formers another 12 hours (including forming and trimming). In addition we know how much ABS they needed, just 3.5 sheets - although the size of the sheets is not known we do know that the ABS was �16.50 per sheet back in 1979 according to Mollo's notes. In today's money that �68 per sheet or over $100 - and I bet you can buy quite a big sheet of ABS for that! Did they just vac-form missing or damaged pieces or the complete suits? If they did how many did they make, 3, 4 ? Did they make helmets or just armor? Can you recast an entire suit in just 7 hours - or just the helmet? How many helmets or suits could you vac-form and trim in 12 hours? We'll update this page as more information becomes available as we investigate further. Our current thinking is that there could well have been up to three new Empire Strikes Back "Mark 2" helmets and (part) armor sets produced for the Carbon Freeze and Bespin Escape scenes - since there just weren't enough decent-quality sets left over from A New Hope. Whether any of these helmets have survived (and their relationship with the Square Frown helmets above) is not clear at this point. However it is strange how the SF Jedi helmets have just about ALL the same detailing as the "normal" ESB helmets including mic tips, decals, frown style and internal padding. We know that a new plaster mould was made and its possible that this mould could have been later used for the production of the Return of the Jedi helmets and armor - although at this stage there isn't enough evidence yet to decide either way. Whatever happened, we're pleased that Paul/Trooper Master opened up this very interesting can of worms! 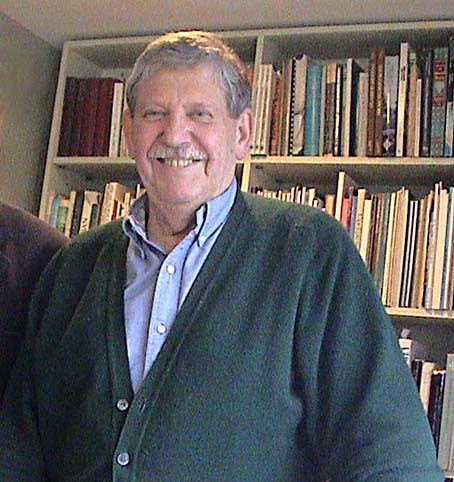 Thanks again to John Mollo for his invaluable assistance - he's a true Gentleman! So we're pretty sure that the helmet seen on the left had side of these shots from the Bespin Carbon Freezing scenes is the same as the helmet seen on the right photographed in Montreal in 2011. The only nagging doubt is the length of the frown although that could be angle/lenses etc. Certainly the overall shape seems to match up as does the angle and marking on the brow trim (see centre markings and they way it crosses the top corner of the right eye lens). Also the left mic tip seems very similar and we can also line up some scuffs on the vocoder too. Above and below some great close up shots from Bigturc of this helmet in Montreal. The key thing were looking at here is material - this is clearly ABS and not (painted) HDPE - yet also has a number of differences from the RotJ helmets. In addition we were sent some interesting shots of six Stormtroopers at Fox HQ in London taken on May 20th 1980 (Empire Day) - with several helmets looking very un-like the ANH style (unfortunately we're unable to show these) However, given we think we've actually placed this in ESB in the Carbon Freezing scene then we think we can be pretty sure now this issue can FINALLY be put to bed. Thanks to everyone for their help. We got there in the end! Basically the Art Department at Elstree made of cast of the helmet and armour, which has a slightly more "RotJ" look about it. 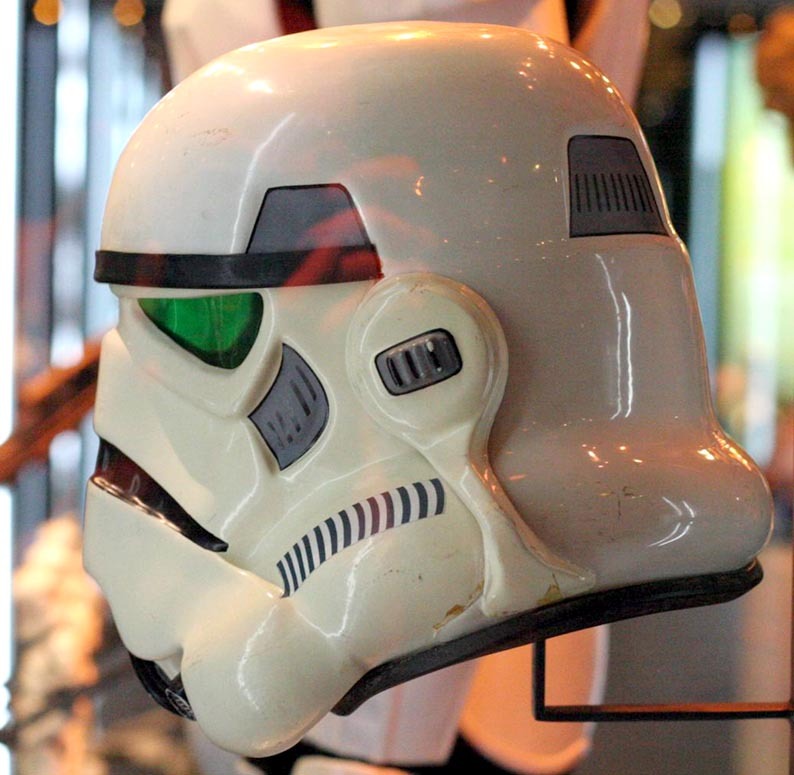 This the became the basis of the helmets and armour used in Return of the Jedi - with just this one helmet used in ESB. BTW these great new shots above and below are from Tom (Big T) from The Prop Den. His photos were taken at an exhibition in Paris.